NOORDWIJK, The Netherlands — The ICPD International Conference on Human Rights began here on Sunday, with strong appeals to promote and protect the rights of every person, without any distinction. The event is convened by the Dutch Government, UNFPA, the United Nations Population Fund, and the Office of the UN High Commissioner for Human Rights. Representatives from more than 130 countries are taking part in the conference, which is scheduled to last from 7 to 10 July. The conference was opened by the Secretary-General of the Dutch Ministry of Foreign Affairs, Renée Jones-Bos. It also heard statements from the U.N. High Commissioner for Human Rights, Navi Pillay, who welcomed progress since the 1994 Cairo International Conference on Population and Development (ICPD), but emphasized the need to press on until the human rights of every person are protected and fulfilled. Dr. Osotimehin recounted some of the gains made since the Cairo Conference: maternal death has nearly halved, access to family planning has increased in many countries and the ability to decide on the number and spacing of children are recognized as human rights. There has also been a remarkable increase in women’s participation in political, economic and cultural life, as well as a growing number of national institutions to address gender equality and women’s empowerment, he added. "Where treatment is accessible, HIV has changed from a death sentence to a chronic, manageable disease," he said, adding that about 9.7 million people accessed treatment last year. The Executive Director also mentioned many of the challenges that remain. More than 60 countries still criminalize the transmission of HIV, access to sexual and reproductive health and reproductive rights is still far from universal, and some 222 million women in developing countries lack access to modern family planning. In many places, the Executive Director said, women continue to be seen as second-class citizens. And girls’ potential continues to be squandered, despite the links between their education and economic growth. “These are not just human rights issues, they are also important development issues,” he added. 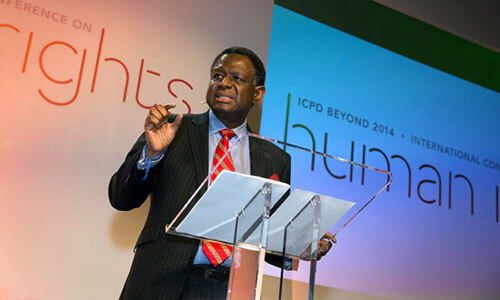 “The ICPD Beyond 2014 review is not about celebrating history, it’s about making it,” Dr. Osotimehin continued. “It’s about translating the lessons we have learned over the past 19 years into a roadmap for the future, and developing a credible framework for tracking future progress. This is essential not only for advancing the ICPD agenda, but also ensuring that the post-2015 agenda and the new international development framework speak to the needs and aspirations of people around the world”. 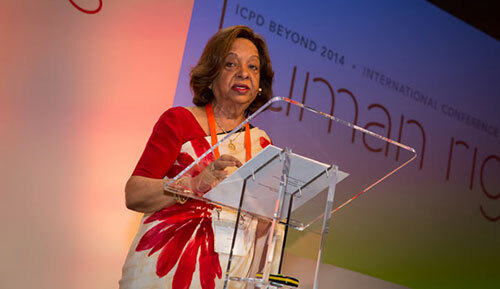 On Monday, UNFPA's former Executive Director and Secretary-General of the Cairo Conference, Dr. Nafis Sadik, gave a keynote speech that offered a historical overview and suggested ways ahead. She offered four suggestions on how to reach universal access to sexual and reproductive health. Her speech was followed by a standing ovation. The current human rights conference is part of the UN General Assembly-mandated operational review of the Cairo Programme of Action. Participants include representatives of civil society and UN agencies, as well as experts and human rights defenders. They are expected to identify best practices in delivering ICPD goals and recommend how to address outstanding gaps in implementation and challenges. A live webcast of plenary sessions is available at http://humanrights.icpdbeyond2014.org/join-us throughout the conference. • tackling discrimination against marginalized groups, including people with disabilities and indigenous groups amongst others.